Johannes Vermeer or Jan Vermeer (baptized October 31, 1632, died at the age of 43, December 15, 1675) was a Dutch Baroque painter who specialized in domestic interior scenes of ordinary life. His entire life was spent in the town of Delft. Vermeer was a moderately successful provincial painter in his lifetime. He seems never to have been particularly wealthy, perhaps because he produced relatively few paintings, leaving his wife and children in debt at his death. 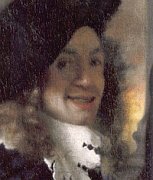 Virtually forgotten for nearly one hundred years, Vermeer was rediscovered in 1866 when the art critic Thore Burger published an essay attributing 66 pictures to him (only 35 paintings are firmly attributed to him today). Since that time Vermeer's reputation has grown, and he is now acknowledged as one of the greatest painters of the Dutch Golden Age, and is particularly renowned for his masterly treatment and use of light in his work.